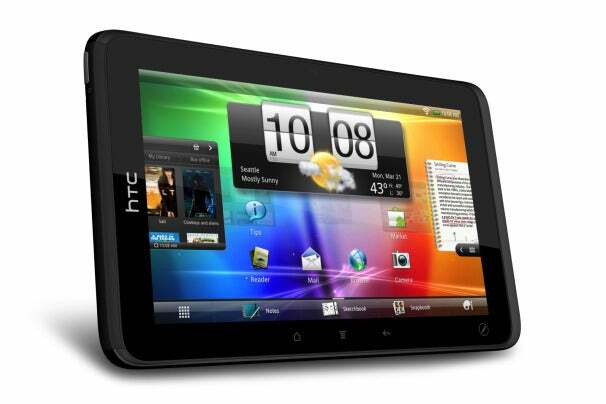 HTC brings a version of its HTC Flyer Tablet stateside, calling it the HTC Evo View 4G. The7-inch tablet was introduced at last month's Mobile World Congress, but at the time, HTC didn't supply U.S. launch plans. Sprint's unveiling today pulls that curtain back; we now know we'll see the Evo View 4G this summer, same time frame as the HTC Evo 3D, also introduced today. The Evo View 4G runs a tablet-optimized version of HTC's Sense interface, on top of Android 2.3. Sprint says the operating system will be upgraded at some point in the future to Android 3.0 (Honeycomb). The tablet also has a 1.5GHz Qualcomm Snapdragon processor, 1GB of RAM, 32GB of internal memory, a microSD card slot, dual cameras (5-megapixels rear facing and 1.3-megapixels front-facing). And it will be able to play Adobe Flash. The display's resolution is 1024-by-600 pixels; and, it supports pen input using HTC's Scribe pen. The digital pen accessory comes with the tablet, and lets you capture notations digitally--for example, highlight a passage or sign a document--and on audio. Like the Evo 3D, the Evo View 4G has HDMI output and DLNA support. 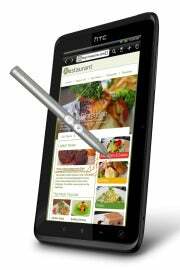 Plus, the tablet can serve as a mobile hotspot for up to eight Wi-Fi-enabled devices; competing tablets typically support just five Wi-Fi devices.